Dr. Adams is an international expert on breast augmentation/ enlargement, breast implants including cohesive gel implants and body contouring procedures. 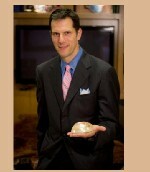 He has developed new techniques for use in clinical breast implant surgery that has made breast augmentation/ enlargement and breast reconstruction safer for patients.He also is active in educating plastic surgeons around the country on the new level of breast augmentation currently possible including a re-defined patient experience and 24 hour recovery. Join Today to follow and contact William P. Adams.